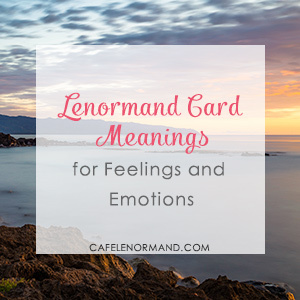 Are you curious about what the Lenormand card meanings are for feelings and emotions? Do you want to know what someone feels about you? Do you want to know if a spread is predicting great happiness for you…or pain and suffering? 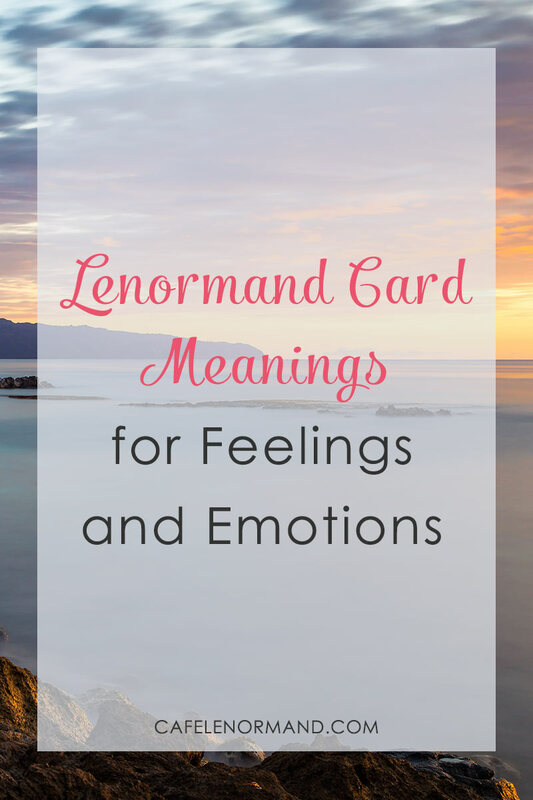 Let this guide to Lenormand card meanings for feelings and emotions help you! When do Lenormand Cards Represent Feelings and Emotions? Whenever a Lenormand card falls next to a person card (to the left, to the right, above, below, or diagonally), the card can mean a feeling or emotion. It doesn't matter if it's a 3 card spread or a Grand Tableau, if a card is next to a person card, it can indicate that person's feelings and emotions. I hope this guide helps you understand the Lenormand card meanings for feelings and emotions. Copyright 2014-2019 Well Read Gnome, LLC. All rights reserved. No reproduction permitted without express written permission. AMAZON DISCLOSURE: CafeLenormand.com (Well Read Gnome, LLC) is a participant in the Amazon Services LLC Associates Program, an affiliate advertising program designed to provide a means for us to earn fees by linking to Amazon.com, amazon.fr, amazon.de, amazon.ca, amazon.co.uk and affiliated sites. Legal disclaimer: This site is for entertainment use only. An opinion expressed on this site is not a form of medical, legal, financial, or other professional advice. We assume no legal liability for any damages, losses, or other consequences of any decisions, subsequent to, or based on, the information provided on this site.